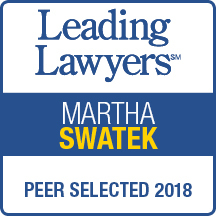 Swatek ♦ Bucko Law Group, LLC ("SBLG"), whose named partners have practiced together for over 15 years, was formed to meet the growing need for a small- to mid-size law firm that handles matters on a personalized and cost-efficient basis. The hallmark of our firm is client contact and participation. We approach each legal matter as a joint effort between the members of our firm and the clients we represent. All attorneys at SBLG have solid and diverse litigation backgrounds and have legal contacts throughout the State, as well as extensive experience in jury and bench trials, arbitrations, alternative dispute resolution ("ADR"), and successful motion practice. Further, our firm has multiple offices located in Chicago, IL and Geneva, IL to better serve our clients. We actively represent a Fortune 500 company throughout the State of Illinois and can handle any issue, large or small. Obtained not guilty verdict for emergency room physician following jury trial where the plaintiff's demand was $10 million. Obtained summary judgment for national retailer in Section 1983 civil rights claim in federal court and then successfully argued and obtained affirmance of summary judgment before Seventh Circuit Court of Appeals. Obtained verdict of $15,309 for national retailer in respondeat superior case following bench trial where the plaintiff's demand was $75,000. Obtained summary judgment and finding of no duty to defend or indemnify for insurance company in insurance coverage case in federal court. Obtained an award in favor of the defendant in a binding arbitration arising from an automobile accident in which the plaintiff suffered a seriously disfigured arm with muscle involvement. Negotiated complex, multi-million-dollar settlement for general contractor in construction accident case where the plaintiff alleged a traumatic brain injury. Obtained summary judgment for national retailer in premises liability case based on natural accumulation rule. Obtained not guilty verdict for national grocery store in premises liability case following mandatory arbitration. Obtained transfer of venue from Cook County to LaSalle County for national retailer in premises liability case where the plaintiff's demand was in excess of $700,000. Obtained summary judgment for national grocery store in case where the plaintiff alleged food poisoning. Litigated and obtained partial settlement for developer in complex construction defect case where the plaintiff's demand was in excess of $7 million. Obtained dismissal with prejudice of a municipal entity after summary judgment was filed based on the Tort Immunity Act.